The parliamentary Finance Committee, revealed on Wednesday, about "gimmick" to manipulate the price of the dollar, foreign exchange companies and banks accused of civil war by standing behind her, as I returned to government loans "would not achieve its goal of being" go to "pockets" economic mafias, an economist said that the loans will reduce the dollar because it would stimulate employment and production sectors, considering that Government bond exchange and payments to contractors, will drive the local market and lead to a State of relative stability. "monetary policy and currency auction lot impact on the dollar." Tamimi applauded, "the Central Bank's decision to impose sanctions on foreign exchange companies or banks that do not sell the dollar at the official rate, revealing" fraud by Exchange companies by selling the dollar more than the official price, without being subjected to punishment." Adding placeholders, to "his company selling the dollar auction currency for an official price partners with official receipts," "partner buy the dollar of the official price specified for the citizen without the Central Bank can hold because it holds no official status. Tamimi confirmed that "the dollar exchange rate is subject to fraud and manipulation of banking firms and banks to participate in the auction to sell the currency," surprised "not to impose sanctions on participants of fraud and manipulation." The mp promised free stream, that "many companies and banks that have a lot of question marks involved in currency auction, a sign that companies and banks are controlling the currency auction and dollar". And on the decision of the Council of Ministers judge that confine buying currency by companies registered with the Ministry of Commerce, said Tamimi, as "good", however "but you better cancel the auction sale of currency and bond funds go." Tamimi felt that "currency stability actually depends on turning the Iraqi economy into a product which raises the value of the dinar. When asked about the impact of government loans to citizens and industrialists and farmers, on the value of the dinar against the dollar, Tamimi felt that "a lot of corruption taint" lending "economic mafias are controlled on those loans." And a member of the parliamentary financial goal, "of government loans or that have a positive impact on the economy or contribute to the development of the country," his be or become poor because they "would go into the pockets of mafias and gangs." On a related level Economist said, nice name, in an interview with Antoine (range), that "some banks and companies that participate in the auction sale of the dollar going the non-committed to behaviors that affect the exchange rate." Antoine said, "some of those companies and banks own methods which enable them to sell the dollar in black market away from Central Bank supervision and controls," returned to "dollar exchange rate stability can be achieved within a short time of being a process linked to the oil price." 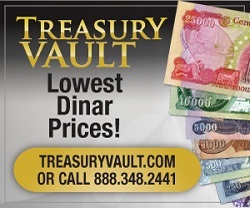 The Economist said that "Government bonds and pay the contractors, will drive the local market and lead to a State of relative stability," adding that "granting government loans would reduce dollar dinar because it will stimulate different sectors of work and production and thus reduce import." The Cabinet had decided, Tuesday (June 29, 2016), restricting the import and export process on behalf of companies registered with the Ministry of Commerce, and establish a "joint" alkmarki clearance process, with first select from next July as the date of implementation. The Iraqi Central Bank, announced Wednesday (22 June 2016), not to deal with the demands of customers who did not submit their importations or special customs permits who adopted the rigging, with banks and money transfer companies committed to submit the names of those customers for uncles to prevent access to foreign currency in the future. Us dollar rate during the past few rise reached 130 thousand dinars.